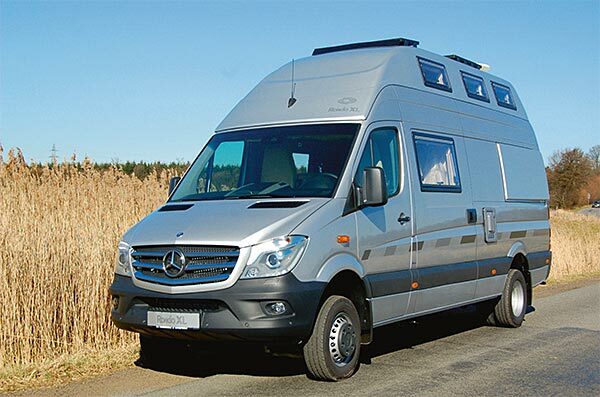 The Rondo XL is based on the Mercedes-Sprinter with the long, 4.325 mm, wheelbase. The vehicle measures 6.94 m in length and 2.02 m in width on the outside. The CDI-engines start at a power of 120 kW/163 PS with 4 cylinders. Optionally available are a 3-litre V6 CDI-engine with a power of 140 kW/190 HP as the top engine. All our engines come equipped with particle filters and meet either EURO 6 norm. Our generally come equipped with a 6-gear manual transmission. Also available is a 7-gear automatic transmission. Essential safety equipment like a new generation of ESP, ABS, TCR and driver/passenger airbags are just as much standard as a remote controlled central locking system, electric windows and heated electrical side mirrors as well as heat insulated glass in the driver's cabin. The list of further optional equipment is long and reaches from alarm systems to Xenon headlights. The Rondo XL is also available with four-wheel-drive. The gross vehicle weight can be either 3,880 kg or 4,050 kg. Also available-mostly for the four-wheel-drive-version- is a gross vehicle weight of 5,000 kg. The Rondo XL combines the large rear bed of our Rondo with an additional bed in the roof. It's constructed for customers that appreciate a box wagon with steel sheet chassis and the corresponding qualities of such a chassis. The Rondo XL offers safety, stability and driving comfort in addition to an excellent amount of living space. The Rondo XL offers a very large rear bed, measuring 146 cm in width and 195 cm length at its' longest equipped with a cold-foam mattress and slatted frame. We are able to achieve this bed thanks to custom made GRP enlargement parts that are placed on the rear of the vehicle. The GRP-roof adds a decent amount of space above the rear bed, which we can fill with overhead lockers on the right and rear side of the vehicle. On the left side are a window and a 90 x 50 cm tilt/slide roof hatch which allow for plenty of fresh air. Optionally available are multiple additional roof hatches. We also offer the option to add flatscreen monitors inside these overhead lockers. The area below the rear bed allows for an overall space of more than 85 cm height, 179 cm width and 140 cm depth used solely for storage. Only the two 11 kg gas bottle as take up any of this storage area. Even with this additional space we still store fresh and waste water tanks with capacities of 150 and 1 00 I as well as the on-board gel battery with 235 Ah in the heated raised floor. This raised floor is the base of the wardrobe and the kitchen area on the right and the wet room on the left side of the vehicle. When constructing the wet room we copied the sink/drawer combination from the Rondo. The sink, located above the cassette toilet, can be pulled out if needed or stowed away when no longer needed. This results in a shower area that is 90 x 70 cm large. The wet room also doesn't lack in storage possibilities, mirrors or light. The wet room is covered with a special, white, high-polish laminate. Inside the cupboard next to the wet room the heater-boiler combination by Truma is situated. It is available in either a gas or diesel variant. The heater combined with high quality isolation allows your vehicle to stay warm even du ring very low temperatures. On the right side of the vehicle, opposite of the wet room, is the wardrobe. Next to it is the kitchen area with an integrated 11 0 I compressor fridge. It also contains drawers, and a lowered sink and cooker. 8oth the sink and the cooker have a glass cover. The cooker uses an electric ignition. We also have a water pressure pump with high quality fittings as standard in every vehicle. Above the kitchen are further overhead lockers for even more storage. The work surface can be extended by a foldable extension. The roomy seating area consists of both MB comfort seats and a special two person bench with two three-point-belts. The table is movable. The roof bad perfectly fits into the roof thanks to special hinges. Just like the rear bed, the roof bed also comes with a cold-foam mattress. Lowering it is very easy and fast thanks to telescope dampeners. The roof bed measures 210 x 150 cm. The space from the roof bed to the ceiling is around 76 cm. 8oth the right and the left side of the roof contain windows equipped with combination blinds. The furniture is made of 15 mm poplar plywood with a high quality HPL-laminate and is lined with massive wood edges. You can create a personalized vehicle thanks to a great number of different, high quality decors that are available. The excellent quality, combined with a very large amount of space and storage area as well as four comfortable, fixed beds make the Rondo XL a unique vehicle.